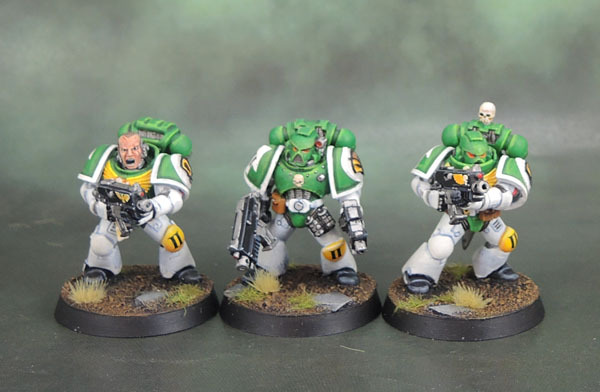 Mentor Legion #3 – Tactical Squad III-1 | Azazel's Bitz Box. Here’s the next part-painted Squad element of my Mentor Legion. 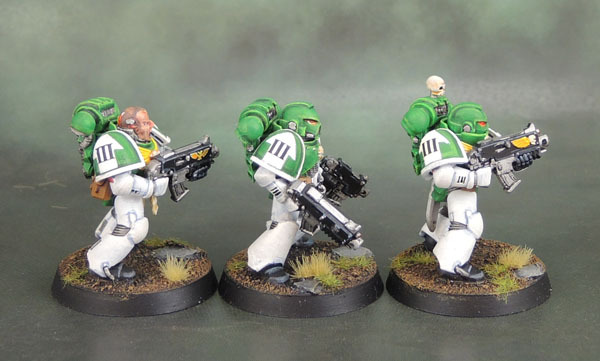 Like the previous models shown, this trio is part of II Company, but this time III Squad. 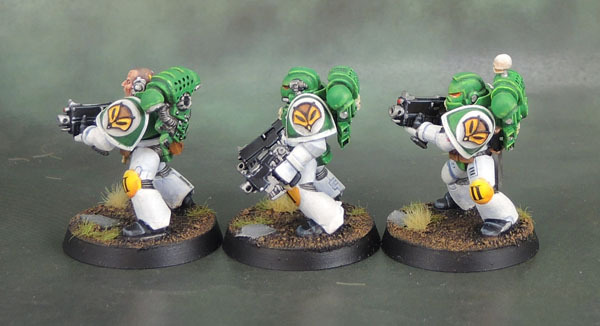 Of course, with 7 members of the squad missing, these guys are much less impressive, but the important thing is they they got painted and completed – finally. While I could theoretically combine the two and run them as a single squad (with another proxy thrown in), I think I’ll just get both squads done properly before I let them hit the table. Ordinarily I wouldn’t even show off a trio of Space Marines like this, but… well, tomorrow will explain it. 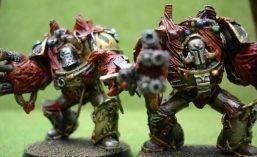 This entry was posted in 40k, Mentor Legion and tagged 40k, Mentor Legion, Mentors, Warhammer 40000, Warhammer 40k. Bookmark the permalink. ← Painting Decemb-uary 2017-18: Part 6 – The Final Round-Up! The Mentor Legion. Now in refreshing lime flavour! G’day mate I couldn’t find an email on your page so I thought I’d comment again. I have a question. Ive accidentally used “gloss” nuln oil instead of matte. Can I go over the gloss with matte and will it darlen the mini too much if I do? Cheers man. Hit it with matte varnish. Valllejo is good, in a pinch paint over it with lahmian medium or even spray with white knight clear acrylic satin from bunnings. Let whichever you use dry. Then if it needs more dark use the nuln oil diluted with lahmian to whatever ratio looks like what youre after. By vanishing the area you can also wash it off fast if you need to. Welcome! Make sure you let us know how it goes once it’s done! Very nice. Looks like you free-handed the shoulder pads and did a very nice job of it. Thanks Ann. I can’t take credit for freehanding these. I painted over (and in) 3D printed chapter icons while the arrows and squad numbers are transfers. Well, whatever the case, it all came together nicely. I like the Mark VIII chestplate dude you’ve got in there. I always associate Mentors with the cool experimental tech like Errant Armour. Really like the facial details on first guy. Very well done! Pingback: Mentor Legion #4 – Assault Squad V-1 | Azazel's Bitz Box.